The corporate world is going green. While this transformation may not get the coverage that electric vehicles do, it’s a big trend change with larger implications. General Motors (GM) announced Oct. 8 that it would power all of its manufacturing plants in Ohio and Indiana with renewable energy. Think about what this means. Now, imagine the opportunity for investors. CMS Energy Corp. (CMS) is one of the power utilities that will supply green energy to GM. Through its subsidiaries, CMS has become a prolific developer of renewable power projects. Its Northwest Ohio Wind business recently completed construction of a 105-megawatt wind project. The facility is expected to generate 320,000 megawatts annually, which is enough juice to comfortably run 30,000 Ohio homes. For the next 15 years, GM will consume all of it — running sewing machines for seat backs and covers in Euclid, and powering the giant robotic arms that help workers build Chevy Cruze sedans in Lordstown. Don’t call it a fad. GM joins many large corporations committed to a zero-emissions future. 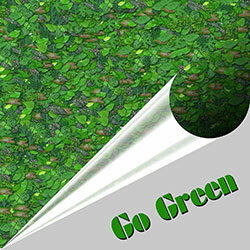 The Harvard Business Review published a research paper in 2002 that concluded companies should make the jump to green. The researchers made the compelling argument that, for businesses, environmental was like aligning the corporation with luxury goods. In the long run, going green offered a strong competitive advantage. It was simply good business. Apple (AAPL) is case study for the power of green initiatives. Through the years, the iPhone maker has slowly morphed into a luxury brand. Its products fetch enormous premiums over competitors. Consumers aspire to own its devices. Green, and now renewable, is part of Apple’s corporate DNA. The company reached 96% renewable energy in April 2017. Managers have been pushing supply chain companies to commit more resources to the same goal. The Financial Times reports there may be a $12 trillion pot of gold waiting for companies that pursue sustainable, low-carbon business models. Procter & Gamble (PG) saved $500 billion. Coca-Cola (KO), Pfizer (PFE) and Sony (SNE) have similar irons in the fire. This is more than a trend. It is a phenomenon — one with a measurable return on investment. The opportunity for investors is multifaceted. Business leaders are pushing climate initiatives. Bankers in New York and London are putting together green bonds to invest in renewable projects. In 2011, the market for such products was a paltry $3 billion. Investors ponied up $81 billion in 2017. Climate Bonds Initiative, a U.K.-registered charity that tracks green bonds, put the size of the market at $1.45 trillion through September in 2018. CMS is a unique electric utility company. Its status as a holding company allows it to partake in many different ownership structures. It also helps managers focus on unconventional goals. The company is run by Patti Poppe. As chief executive, she is pushing the Michigan company with a vision of people, planet and profit. Apart from the preponderance of alliteration, Poppe is on to something, in an Apple sort of way. The big idea is to find creative ways to finance the green energy projects that have been embraced by corporate America, while building in solid, sustainable profits. After all, the best big ideas are the ones that are self-sustaining, through profits. As a company, CMS has become a fixture on the list of best Michigan employers. It invests in employees. Given its pledge to become greener, the company is constantly pruning inefficient facilities. Many of these are coal-burning. The company works with developers to decommission these sites and find employment for local workers. Its green bonafides are strong, too. CMS has committed to zero coal by 2040. It is Michigan’s No. 1 green energy company. It reduced its carbon emissions by 5 million tons, while curtailing water use by 100 billion gallons. In its first fiscal quarter for 2018, ended in August, the company grew earnings 21%, while increasing sales by 6%. The secret sauce is that CMS is able to self-fund the vast majority of its projects using tax deductions, tax planning, sales and non-utility earnings. 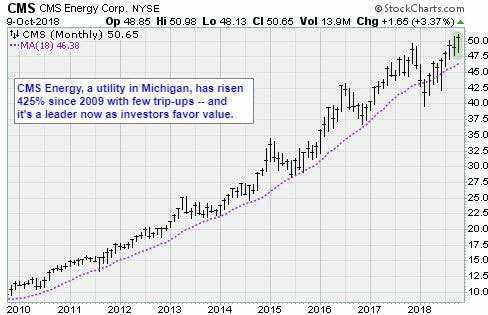 For example, in a conference call with analysts last year, Rejji P. Hayes, chief financial officer, noted CMS is planning to spend $10 billion on capital investments during the next five years, without negatively impacting the core utility business. The enterprise has the potential to get larger, without greater risk to shareholders. Shares are up 7% this year and pay a 2.8% annual dividend. 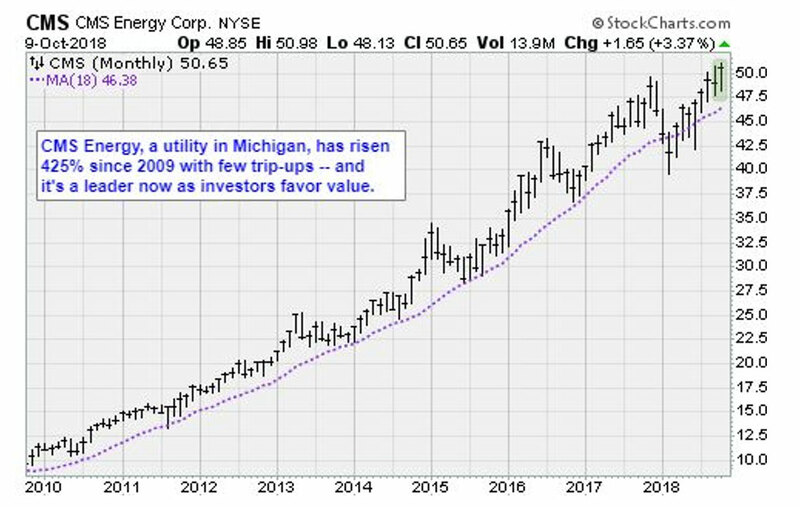 More important, utilities are showing excellent relative strength as investors search for safety. The market capitalization is $14.2 billion. At 20 times forward earnings, CMS is not inexpensive. But unique opportunities rarely are. CMS is in the right place at the right time. It is a green utility in an era where corporate customers are demanding renewable energy. Power on. Does anyone remember “Scientific Research Tax Credits” ? Unfortunately… these were paper entries with no need to do the actual Research.. In time these Credits were being traded between companies who tried to get the cash value out of them by reselling what they bought and making a profit on the transaction… Sure sounds like “Carbon Credits” to me.